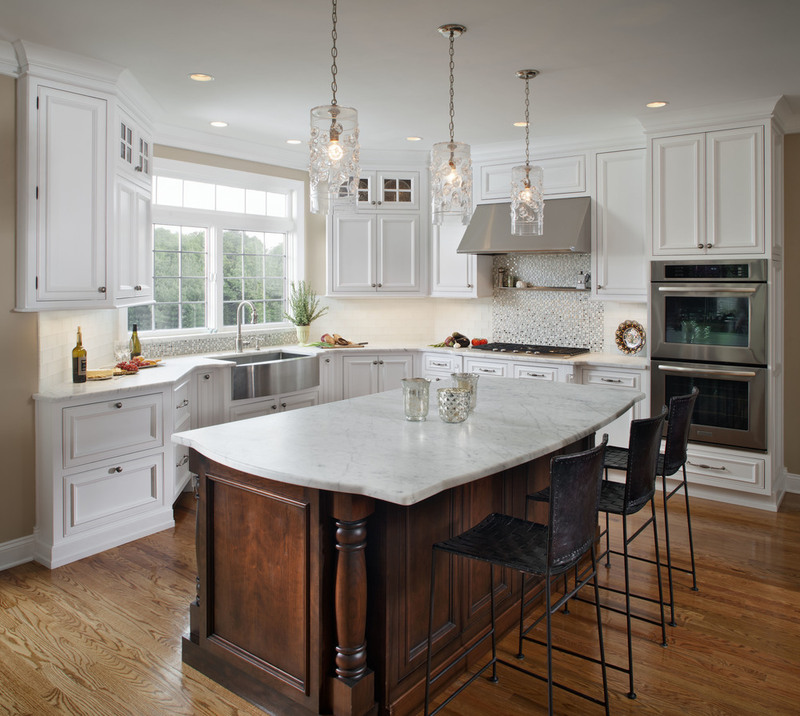 At Lang's Kitchen & Bath, we service all kitchen remodeling and renovation needs of homeowners in Bucks County, PA. Whether you need a new kitchen or a fresh redesign, our experts can help! A kitchen remodeling project is a major undertaking that requires the knowledge and experience of a kitchen design professional. At Lang’s Kitchen & Bath, we realize that your goals and dreams for your kitchen design are unique. Perhaps you want an open space for entertaining many guests, or maybe you are looking for a cozy atmosphere for intimate family meals. Whatever your goals are for this room, we start every home remodeling project by getting to know your goals. Our experienced professionals then craft designs that bring your design requirements to fruition within an agreed budget. This copper hood is a central feature of the beautifully-designed kitchen which also features carved moldings and a custom hutch. See More Photos. Are you unsure exactly how you'd like your kitchen remodel to proceed? Let our kitchen showroom spark your imagination and get your creative juices flowing. Based in historic Newton, we are conveniently located to you if you're in Bensalem, Feasterville-Trevose, Levittown, Yardley or New Hope. We work with you to identify exactly what your requirements are for your new kitchen. After that, our designers will amaze you with plans to efficiently utilize your space while accomplishing all of your design goals. Our website also has an extensive kitchen remodeling gallery, with projects and styles to inspire your remodeling plans from the comfort of your home. Whether you're leaning towards a traditional, farmhouse, southwestern, contemporary or any other design style, you will find images to spark your creativity and help you define your design requirements. We offer kitchen design concepts and product selections that are second to none, with a wide range of options available to meet different budget demands. Lang’s Kitchen & Bath will achieve maximum value for your kitchen remodeling dollars spent. We incorporate all elements such as flooring, backsplash, countertops, plumbing and lighting fixtures and custom cabinets, and bring them all together into a cohesive design that seamlessly blends into your desired kitchen. At Lang’s Kitchen & Bath, our kitchen and bath renovations have impressed our customers in the Bucks County area for years. With our kitchen showroom, we offer many options to help you visualize what you want to achieve. Our team of kitchen design experts brings years of experience integrating quality materials and products into a finished design, for a range of budgets. Whether you want semi-custom, custom popular, furniture grade, or luxury cabinets, we will design and install the kitchen you want. We make it a priority to deliver as quickly as the project timelines allow, depending on your design and product choices, because we know you want to be in your new kitchen as soon as possible. If you want a new kitchen for your home, please give us a call at Lang’s Kitchen & Bath. You can also stop by our Newtown location and have a look at our kitchen showroom. You will be impressed by the wide variety of quality materials and products that we install as part of our kitchen and bath renovations. Whether you want to redesign or remodel your kitchen, bathroom or any other room in your home, please contact us. We will show you why we are the first choice of so many homeowners in Bucks County.